There is now a new line of soaps at Thompson Chemists from VIVO Natural Products. With these soaps that come in a variety of scents (green tea with mint, english lavender, rosewater & jasmine, lemongrass & verbena, and brazilian acai & pomegranate) you’ll be able to discover the moisturizing benefits of African shea butter. They are natural vegetable-based soaps that will gently exfoliate your skin. Not only that but your purchase of these soaps will make a difference in the lives of the women of Togo, West Africa. 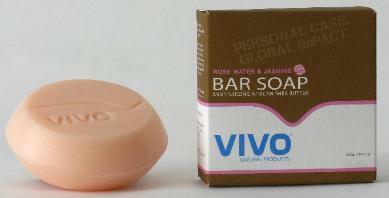 VIVO Natural Products are partnered with them for the shea butter used to make the soap. Our favorite is rosewater & jasmine, which one is yours?